NextGEN allows you to import three items of meta data from all of your images, and also provides an option to display your meta through captions. Title of the Image will be imported as the 'Alt & Title' text. Caption of the image will be imported as the description. Keywords of the image will be imported as the tags for the image. 3) Select in bulk actions dropdown 'Import metadata' and then click 'Apply'. When the process is complete, be sure to save changes! 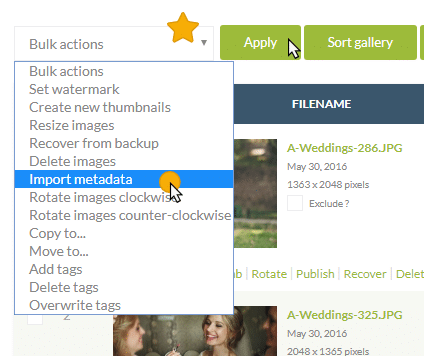 Titles and descriptions will appear in the info (caption) area of your gallery displays.